The AquaSnap function is historically the first implemented function and it has given its name to the program. It's also one of the most important functions of the program. The initial goal was to port the Aero Snap function of Windows 7 to older version of Windows (Vista, XP and 2000). 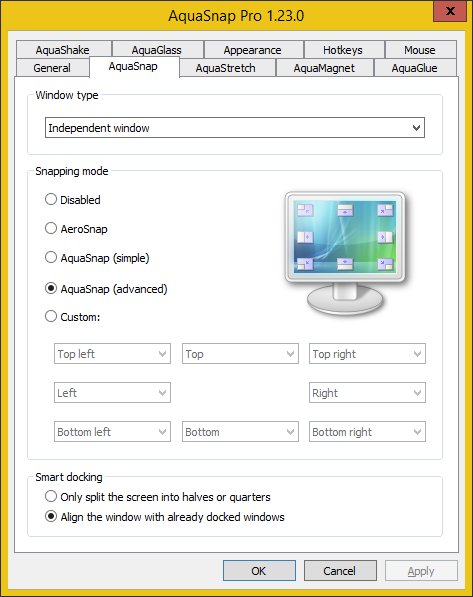 Now that Aero Snap is present by default in all modern Windows versions, we have improved the AquaSnap function to offer new possibilities not possible with the built-in Aero Snap function. The AquaSnap function allows you to easily split your screen simply by dragging your windows to the edges or corners of the desktop. Window type: AquaSnap allows you to set different docking settings for the handling of normal independent windows and for the child windows of MDI applications. This setting allows you to choose which type of windows you want to configure. Independent window: when selected, you are configuring the docking settings of the independent windows. Child window of a multi document interface (MDI): when selected, you are configuring the docking settings of the child windows of MDI applications. Snapping mode: this setting allows you to choose between different window docking modes. The default value is AquaSnap (advanced). Disabled: when selected, windows docking by dragging a window to a side or corner of the desktop is disabled. AeroSnap: when selected, AquaSnap will mimic the behavior of the built-in Aero Snap function of Windows 7. Dragging a window to the right or left side of the desktop causes the window to fill the respective half of the screen. Dragging a window to the top of the screen maximizes it. AquaSnap (simple): when selected, dragging a window to the right, left, top or bottom side of the desktop causes the window to fill the respective half of the screen. AquaSnap (advanced): when selected, dragging a window to the right, left, top or bottom side of the desktop causes the window to fill the respective half of the screen. Dragging a window to the top-left, top-right, bottom-left or bottom-right corner of the desktop causes the window to fill the respective quarter of the screen. Custom: this allows you to choose which action is triggered when you drag a window to an edge or corner of the desktop. Smart docking: this setting allows you to choose how the space on the screen is divided when you dock a window. The default value is Align the window with already docked windows. Only split the screen into halves or quarters: when selected, the desktop is always divided into equal halves or quarters.